This is such a cool pattern!! I made the regular Noro striped scarf last year for a friend. I’ve queued this one up for myself! I’m interested in the knitted border pattern on the top of your blog page. It’s in tri-color: eggplant, green 3 row of ribbing (I think) and 4th row something else? I should’ve also asked what brand of yarn and color you knit the pattern stitch you use as the top of your blog border. 3-color eggplant/purple, green, tan. The yarn and colorway are Lily Sugar’n Cream in country side ombre. This is a great pattern! Just love the colors. I’m an editor for FaveCrafts.com, and I took the liberty of linking to your blog from my roundup blog post of free scarf knitting patterns. You can check it out here. I also just published a collection of free scarf knitting patterns at our website if you are interested. Thanks for sharing! I picked up some Plymouth Yarns’ Gina, it’s looking great so far! The “original” pattern can be rather manly, but I love that this one sort of feminizes the pattern, it almost looks woven. Thanks so much for this! I’m new to knitting. Please, what does Cc and MC mean? Welcome to the world of knitting 😀 Hope this helps! Not sure what I am doing wrong, but my version of this scarf looks nothing like the photo. I am using Plymouth Gina, very close to Noro Kureyon. I went down one needle size from the #7 recommended. And I have been watching my tension, but it is still pretty lacy instead of woven looking. Any ideas? I think it all depends what you want the finished product to look like. You could be a really loose knitter, so a US size 5 or 6 might give you the fabric you are looking for. I am a tight crocheter, so I typically go up 2 hook sizes. The lacy version of this scarf can be pretty, too. The first time I made this pattern it was a little lacy. Can this be made without changing yarns? Any idea of the effect? 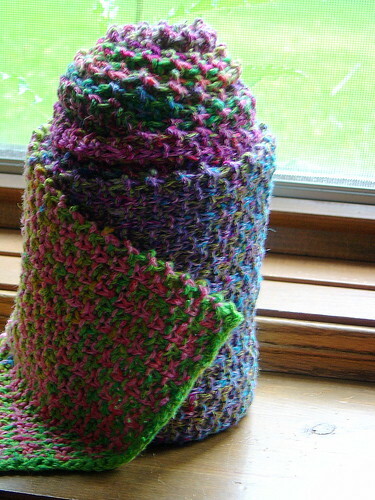 Yes, it can be made using only one yarn. 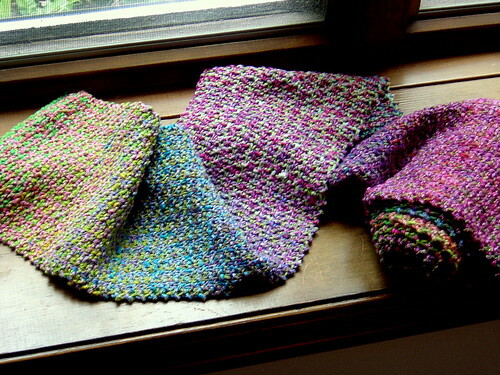 It creates a scarf with a beautiful textured look to it. So absolutely pretty! Looks very warm and comfy, too. Is it possible to increase the size to make a stole or wrap? Absolutely. Cast on as many stitches as you would like, as long as the number is a multiple of 3. I would love to see it when you are finished! Thanks so much for the info! I will do my best!